The MAGIC3 GO® catheter is a hydrophilic, female length catheter with a robust handle for better control, a discreet consumer package and a coating that maintains the catheter in a hydrated state so that it is ready to go out of the package. MAGIC3 GO® handle provides the user with an ergonomically designed area for a secure grip. It can easily be connected to a collection device. Designed to minimize the risk of contamination by enabling the user to hold the catheter without touching the catheter shaft. 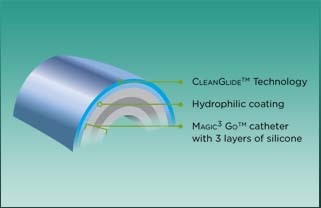 MAGIC3 GO® catheter is a three-layered silicone catheter designed to glide easily and comfortably through the urinary tract. 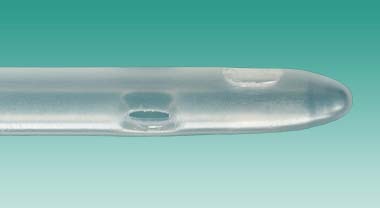 MAGIC3 GO® catheter offers a comfort-designed tapered tip with four drainage eyes for maximum drainage and flow of urine. The MAGIC3 GO® catheter package is discreet and gives you the ability to carry it folded in a compact format. Easy to Use – Ready to go right out of the package without the need of adding water or lubricant.